Take action against the unprecedented onslaught on raptors in Lower Austria! Buzzards and Goshawks are open to persecution in Lower Austria! The provincial government of Lower Austria has recently issued a decree allowing hunters to shoot 200 Common Buzzards and 40 Goshawks until January 31st. Since there is no adequate control, this is likely to result in the erroneus shooting of endangered raptors like Saker Falcon, Peregrine Falcon, Hen Harrier, Marsh Harrier, Sparrowhawk, Rough-legged Buzzard and Red Kite, all of which occur in substantial numbers in Lower Austria. There may be even casualities among White-tailed and Eastern Imperial Eagles. and help to ensure that EU-law protecting raptors is properly enforced in Austria! There are only a few days left till the beginning of a new Spring Alive season! From the 1st February children all around Europe will join again in observing and recording arrivals of four migratory bird species: White Stork, Barn Swallow, Common Swift and Common Cuckoo. So be ready and start looking for the spring messengers! Spring Alive is an initiative from BirdLife International. LPO is the French BirdLife representative. The annual migration survey started yesterday at col de l'Escrinet. The daily migration survey at col de l'Escrinet, Ardèche, started yesterday (19th January). Philippe Descollonge will be the migration watcher, assisted by two other salaried birders. The spring survey will last until 31st May 2009. In previous years, we have collected some evidence that thrush migration already starts in the 3rd decade of January. This is important for the closure of the hunting season. Electronic tags have offered an insight into the mysteries of the 20,000km migration of Manx shearwaters. Might Migrating Birds Have Infected The Svalbard Arctic Fox With Parasites? The cat is the main host for Toxoplasma and spreads the infection in its droppings. Previous research has shown that isolated island groups without cats are in reality free of the parasite. New research suggests that migratory birds are a probable source of infection for the Arctic fox population on Svalbard (the Spitsbergen archipelago). The Annual Conference of International Wader Study Group will take place 18 - 21 September 2009 in The Netherlands (island of Texel). Wader/shorebird enthusiasts from all over the world are cordially invited to join this conference. Dusky Thrush in Belgium: finally a living bird! 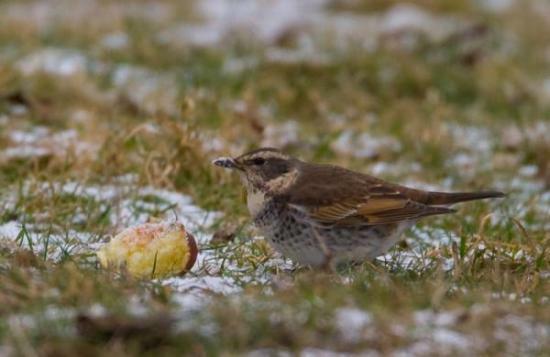 A Dusky Thrush Turdus naumanni eunomus was discovered at Erezée, province of Luxembourg, Belgium on 3 Jan. 2009. The next three days, it was seen by many birders. There were also six Waxwings at the same site. This is the first field observation of a Dusky Thrush in Belgium. All previous records concerned trapped and killed birds: 1) 1845 Ardennes (market of Namur); 2) ca. 15 Oct. 1853 Brussels (in a poultry shop); 3) 5 Nov. 1905 Hastière (Namur); 4) Nov. 1906 Seloignes (Hainaut); 5) 11 Nov. 1956 Beerse (Antwerp). In all cases, these thrushes were killed and sold for consumption. A captured bird on 1 nov. 1970 at Wingene (West Flanders) - published with a fairly good description (De Witte Spreeuwen 21,8: 501-502) has not yet been examined by the Belgian Rarities Committee (BAHC - CH). In France, there are two accepted records of Dusky Thrush since 1981: 23 Nov. 1983 Tardinghen (62) and 21 Jan. 1994 Seyssel (74), as well as 2 records of individuals sharing characters of both naumanni and eunomus: 16 Nov. 1997 Ginasservis (83) et 27 Oct. 1999 Crac'h (56). Since 14th December, Migraction is also available in Dutch.